Update from Sarah Jane, September 26, 2018: So, the GOP has scheduled a committee vote on Kavanaugh for Friday. Yes, for the day after they hear testimony from Dr. Christine Blasey Ford. That shows you how serious the GOP is about hearing out Ford and Ramirez, or actually considering the accumulating evidence against Kavanaugh’s fitness for SCOTUS. All hands on deck, all. If you haven’t called your Senators at (202) 224-3121, do it now. If you’ve called, DO IT AGAIN. NO to Kavanaugh. Don’t let him pass through committee. If you don’t have a member on Judiciary, tell them NO for the full floor vote. The objective is to stop this in committee, but given the makeup of the committee, I suspect it’s unlikely. So once it hits the floor, we have to: – lock in all Dems, – flip two GOP. Lock in: – Manchin – Heitkamp – Jones – Donnelly Try to flip: – Collins (TBD, honestly) – Murkowski – Flake (maybe) So if you’re repped by any of these Senators? Your calls are especially crucial right now. [Citing a tweet about scheduling from the Senate Judiciary Committee, which is a screen shot I can’t reproduce] Let’s be honest, do we really think Grassley will delay? No, unless there’s overwhelming outrage. 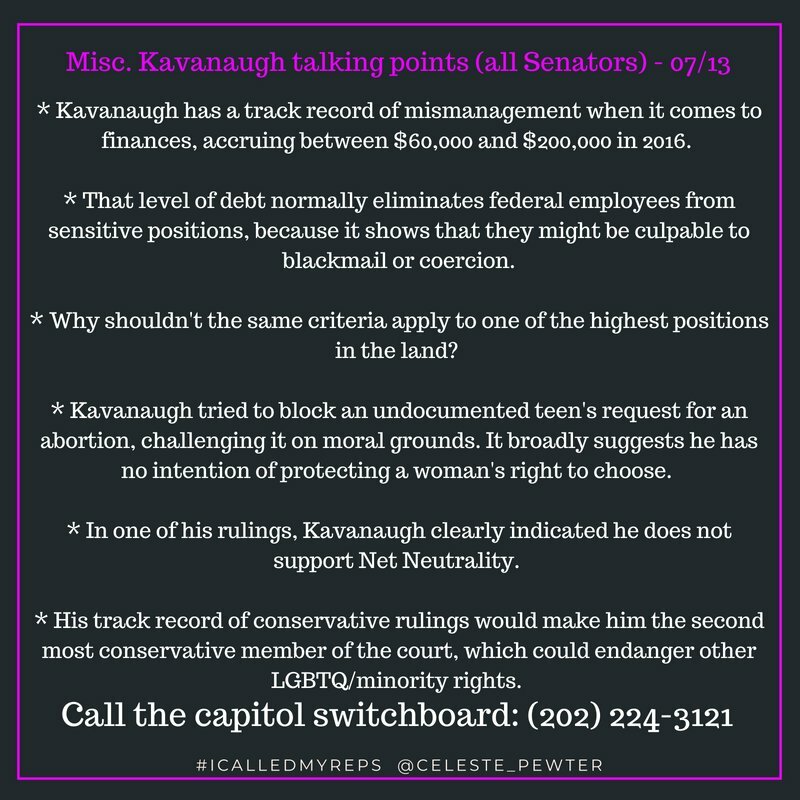 Be loud and CALL YOUR SENATORS. Yep. 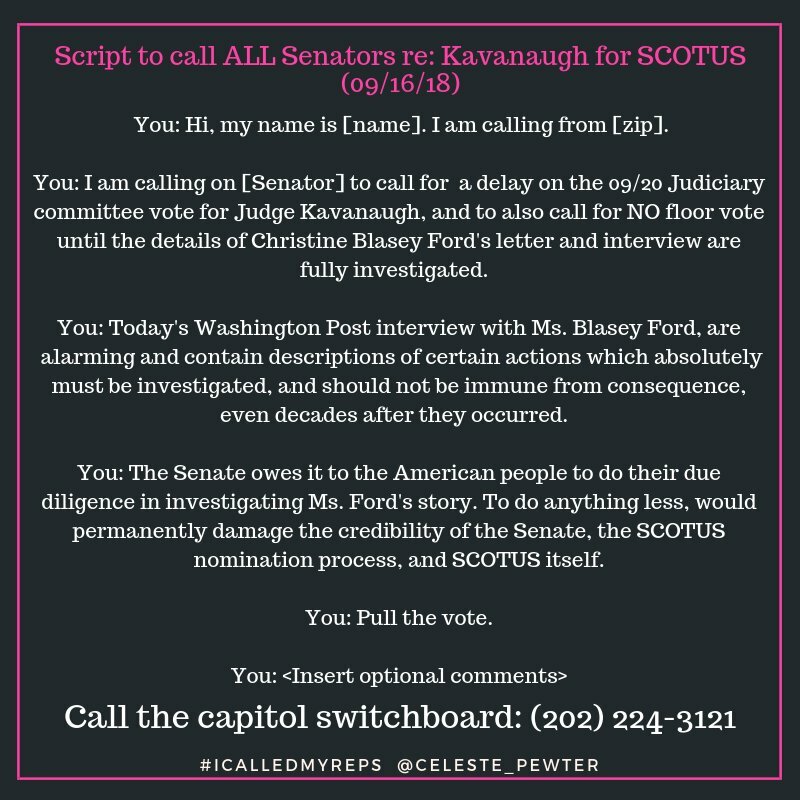 Keep calling your Senators on Kavanaugh, and keep urging friends and family to call daily. 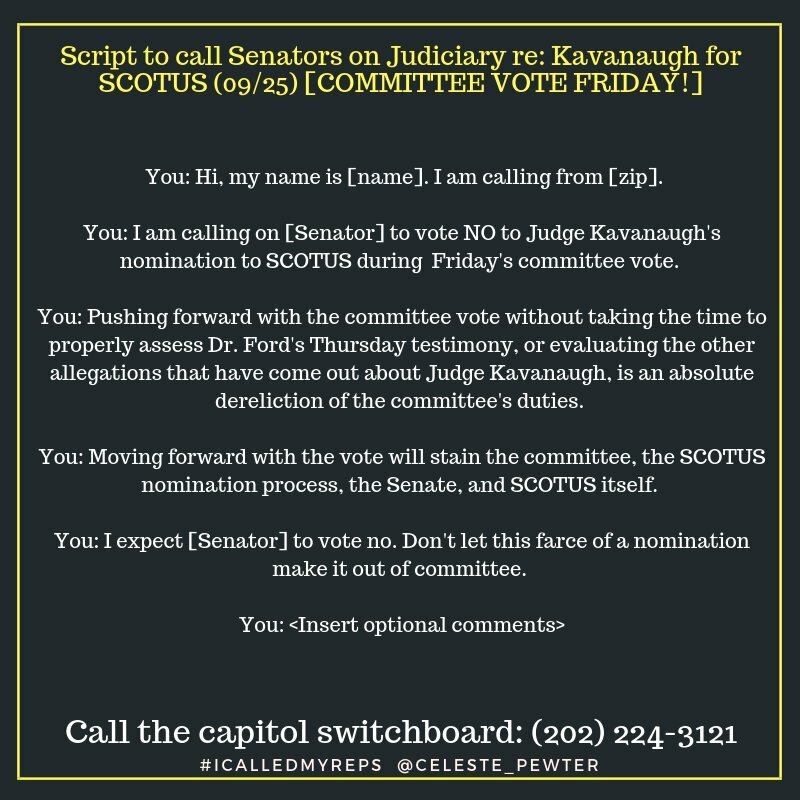 If your Senators are on the Judiciary Committee, it’s extra-important for you to call. Ditto if your Senators are Lisa Murkowski, Susan Collins, Jeff Flake, Ben Sasse, or Bob Corker. 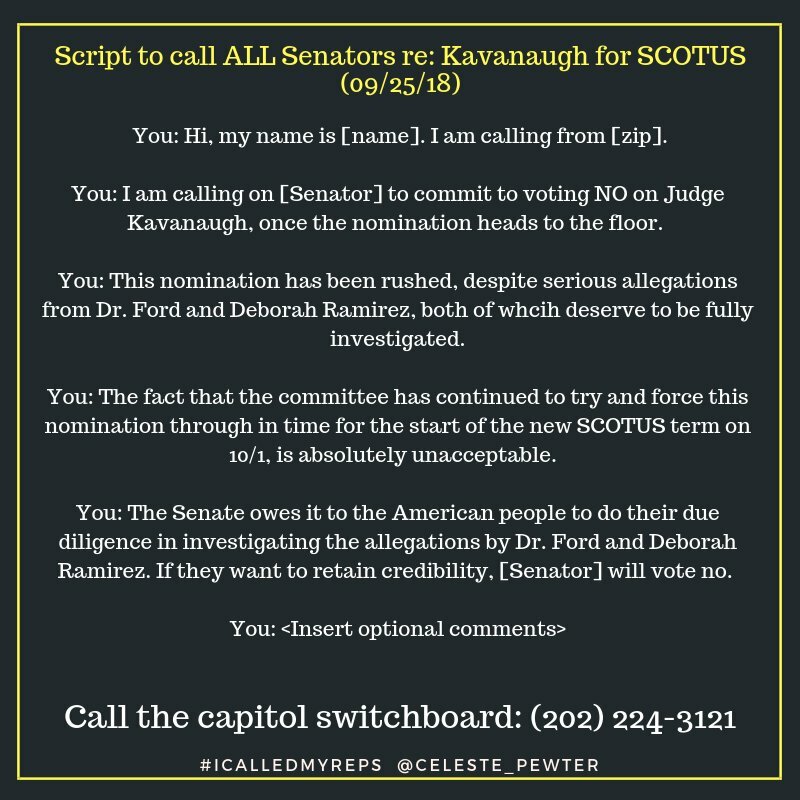 Here is a calling script Celeste Pewter (@Celeste_Pewter on Twitter) wrote on Tuesday to use with all Senators. If either or both of yours serve on the Judiciary Committee, scroll down a bit for a special script for them.